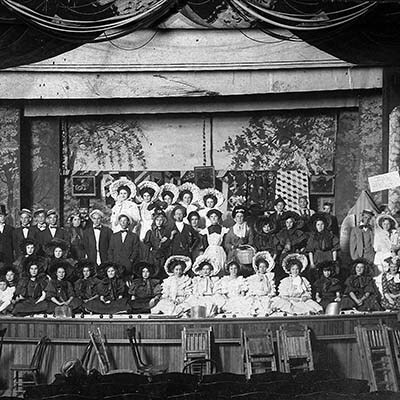 More than four dozen performers participated in a local talent show Nov. 8, 1907, at Marion's three-year-old community auditorium. From 1905 to 1919, the cultural center of Marion was the city’s sprawling Auditorium, built by citizens’ subscriptions to a local stock company for what today would be the relatively meager sum of $37,000. Constructed of “patent stone,” a more decorative precursor to concrete block, the building, situated where the city’s post office now stands, seated hundreds on its lower level and included a gracefully curving balcony with almost as much seating and a huge stage. Vaudeville troops, silent films, and political speeches were weekly fare in the Auditorium, but the city did not rely solely on imported talent for its entertainment. On Nov. 8, 1907, one of the largest audiences ever attended a hometown talent show featuring dozens of performers under the direction of promoters Idella Harris (1878-1919) and Florence Rogers (1866-1940), wife of prominent physician J.N. Rogers. All are buried at Marion Cemetery. The event, which included children dressed as dolls, raised the modern equivalent of $2,250 to help pay for repairs and improvements at what it is now Valley United Methodist Church. Despite its popularity, the Auditorium was short-lived. It survived a fire that badly damaged its stage in 1914 and then was destroyed by a 1919 fire in which a traveling salesman who was trying to help fight the blaze died when one of the structure’s exterior walls collapsed. Remains of the structure show up on city maps for several years afterward, but performances were shifted to the newly constructed high school auditorium. The site eventually was leveled and made way for the city’s post office, constructed in 1938 by the Depression-era Public Works Administration.